Hello ! My Name Is Sid ! Packed full of personality ! Excited To Meet My New Family"
Meet Sid, He is packed full of personality ? He is to cute for words ! Sid has a fluffy soft plush black and white coat coloring. He is a bundle of joy and loves to go on his walks, He is wonderful eye catching little companion on his walks in the park. 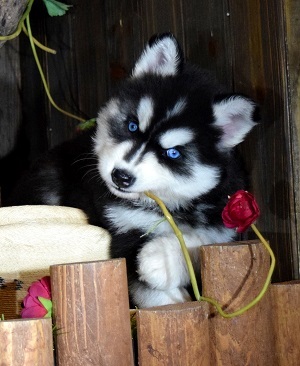 Just take another look at this beautiful face and he will be sure to steal your heart ! . Sid is waiting to bring joy to his new home. 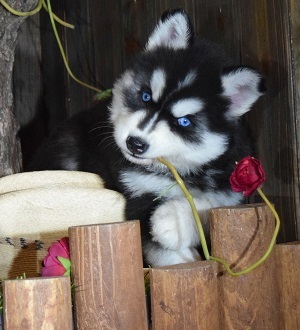 He, is a very active.loving and healthy, purebred Siberian Husky pup loves attention and doesn't mind giving tons of puppy kisses!! Can't wait to jump into your arms ! 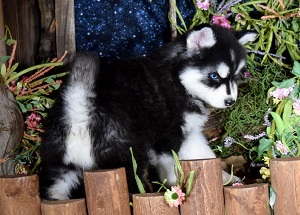 He has those striking ice blue eyes like his Mother ( Star-Keeper ) and the most stunning beautiful thick coat like his Father ( DJ )! . Sid will be trained to walk on his harness without any pulling. He loves to go on his walks and meet everyone on his way. For More information on Sid click on Delivery information at top of page. you may have, and help you determine if Sid is right for you. may have, and help you determine if Sid is right for you. Hello ! My Name Is Sid ! You will need to add Sid to the cart and put a $200.00 holding fee on her.